I’ve been feeling a bit rundown the past day or two, so of course chicken soup came to mind. This low sodium version is adapted from a classic Guatemalan recipe served at restaurant Pura Vida here in Philadelphia. Full of veggies, chicken, garlic and ginger, it’s a powerful folk remedy for whatever ails ya. I’ll be running full steam ahead in no time. Oh yeaahh. Saute the chicken thighs over medium-high heat, about 5 minutes per side. Remove from heat, cool to touch, then dice. Set aside. 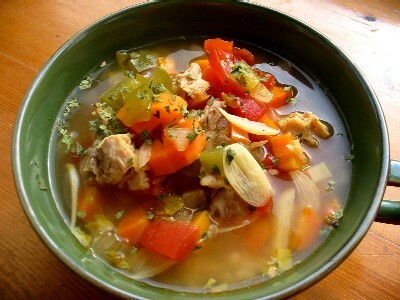 Combine remaining ingredients EXCEPT chicken, ginger, celery and rice in a large stock pot. Bring to a boil over high heat. Once boiling, reduce heat to low. Add chicken, ginger and celery. Cover pot and simmer for 45 minutes. To serve, spoon 1/2 cup cooked rice into each bowl and ladle soup over top. Garnish with cilantro if desired.